Construction and demolition waste (CDW) is one of the priority targets of European Commission, because of the large volume of generated waste and its high potential for re-use and recycling. Moreover, a negligible percentage of waste is destined to reuse mainly because the majority of the existing buildings was not designed for disassembly and reuse. 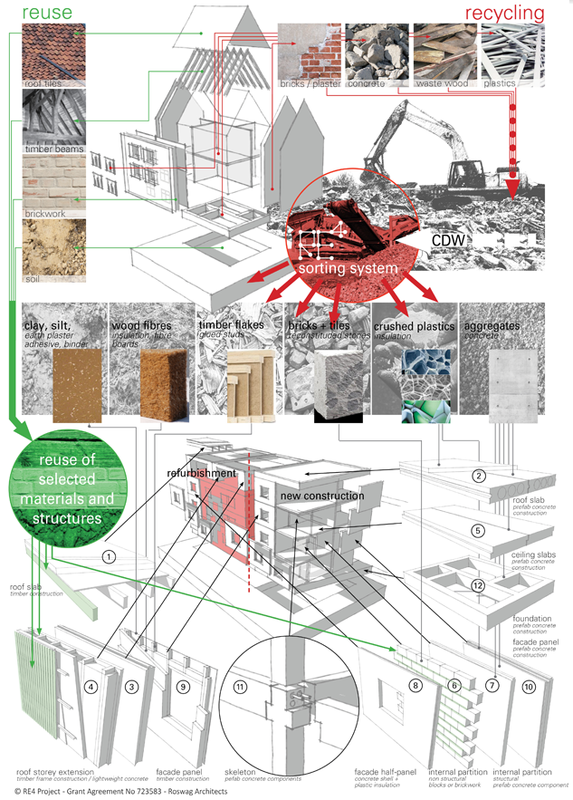 RE4 project aims to promote new technological solutions and strategies for the development of prefabricated elements with high degree of recycled materials and reused structures from demolished buildings. The main aim of the project is to develop energy efficient building produced from CDW, thus minimize environmental impacts in construction industry. The building component will be suitable for both new construction and building refurbishment. The final building design will be used to demonstrate the developed solutions and support the dissemination of the project. The demonstration activities will be carried out in Spain and Ireland to validate concept indifferent climatic conditions. The innovation is firstly focused on the development of new sorting technologies. Such first stage of the recycling process establishes the amount of recycled material and also the possibility to properly close the product chain maximizing the product value. Such fraction/material/structure from CDW will be studied and processed with 3 different technologies (casting, extrusion and moulding) and transformed in the new or adapted prefabricated components highlighted in Figure below. The prefabricated component developed in the RE4 project will be finally assembled into a RE4 prefabricated energy-efficient building concept designed for an easy installation and dismantling. Development of innovative design concepts for smart installation and disassembly of the pre-fabricated elements into a prefabricated energy-efficient building unit The concepts will be designed in such way that multiple applications for different building typologies (e.g. residential, commercial) will be easy to implement. RE4 demonstration in industrial environment, testing and evaluation, replication Demonstration of the proposed RE4 solutions for new constructions will take place in two specifically constructed mock-ups representatives of building archetypes across Europe consisting of a two storey building. Enhancement of the sustainability and future applications of RE4 prefabricated products From a quantitative point of view, the following objectives are targeted in relation to: CO2 savings (over 30 %), energy savings (20%), higher resource efficiency (minimum share of recycled materials in final product up to 65 %), less waste generation, less CDW disposal in landfill. Development of a BIM-compatible DSS and platform for CDW estimation and Management A BIM-compatible tool will be developed with the aim of supporting owners and construction/demolition companies by providing an estimation of the types and quantities of CDW that will be generated during construction/demolition, with possible utilization options and related logistic references. Development of business models for industrial exploitation The expansion of size and attractiveness of CDW recycling and reuse for energy efficient buildings construction and refurbishment will promote an efficient value chain, creating attractive business opportunities for the involved stakeholders. Demonstration of the RE4 solutions will take place in two specifically constructed mock-ups (residential or non-residential demo buildings) in two different climatic regions (UK, Spain). Demonstration of refurbishment solutions will either be realized in a suitable existing building and/or in the demo site available at STRESS. Strategy for disassembly and reuse materials and structures from dismantled buildings will be either demonstrated in a suitable existing building (if available) and/or in the Acciona demo park. Demonstration of the high replication potential of the developed solutions outside EU will be achieved through the construction of a further demo building in Taiwan.